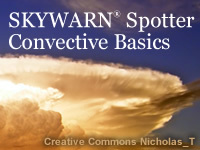 The "SKYWARN® Spotter Convective Basics" module will guide users to a basic understanding of convective storms. Through three different scenarios, you will cover reporting and proper communication of local storm reports to the National Weather Service (NWS), personal safety during these events, and field identification of convective storm hazards. After completing the scenarios, you will be given the opportunity to practice identifying storm features from a spectrum of photos. Very informative and relevant in my area of operations. Thank you for the retraining and I most likely will revisit this lesson with my children at some point to educate them as well. This is a must for anyone living anywhere near the coast. I've grown leery of online training, but this is rpetty good. overal, very good and I enjoyed learning. minor corrections:scenario 1: after the video of reporting hail, The 'Done' button didn't work.question 7 asks for the 'Best' answer, then lists 2 correct answers. Very useful. Learned a lot! The old NWS Basic and Advanced SKYWARN Spotter Training courses were much more easy to comprehend and complete. I've been taking SKYWARN training every two years for probably eight years now, and I found this presentation lacking in clarity. See my previous comments. The answers to the next question "What is your prior experience with the subject of this lesson?" tells me this course was not made for SKYWARN spotters since there is no answer option that includes anything alluding to a "volunteer spotter". Good lesson. Interesting and informative. great learning tool, very specific to good photos. Provided the necessary information and was easy to understand. Some of the Photos weren't the best, but did not affect it overall. Good overall knowledge. Would like a more indepth training also. Cloud galleries are good examples, but could be better described and shown in more context. This was a well put together, and well thought out lesson. Well put together. Informative. Learned a lot. Definitely recommend keeping the photo gallery handy and reviewing/comparing to observable weather phenomena. The practice quiz/review answers were difficult to determine is they we referring the the situation being presented or questions for general overall comprehension. For example, towards the end of this lesson it asks about what should be reported and the question is looking for the answer to the general question...not the situation just presented. Good, basic convective weather information. Very well put-together and relevant. Highly recommend to anyone! Some of the questions lack the essential information to answer them definitively. Some questions are vague and have several possibilities for answers. I also disagree with some of the "correct" answers. Making good quiz questions is not easy as this lesson illustrates. Great information and informative for Storm Spotting and Reporting to NWS. Very useful information for Ham Operators and Communicators in Emergency Management. Draw lines on pictures to highlight cloud features. I strongly support these lessons they are very helpful. Photos of storm clouds with descriptive captions underneath is nice, but photos of storm clouds with identifying labels on the various components of the pictured storm would be more beneficial. I especially think a better visual on the difference between a vertical updaraft and an angled updraft should be considered. I enjoyed the video clips, photos and information learned. I will now be more able to visually understand cloud formations. I enjoyed the lesson, learned lots of information and should help me in my duties with emergency management. With very little previous knowledge this helped. Was a good lesson! Definitely learned some things i did not know about storms and things that i was misinformed about growing up. I found it very interesting. Would recommend it to other people. Loved the videos. This was a great course and I look forward to being a spotter. Great for being part of the solution and not the problem. Good lesson, but could use better details in some areas. Definitely have a better understanding of weather and types of communications and things to look for now. More videos of severe weather and information on generally safe locations to be in relation to radar coverage of the storm track to avoid the severe portion of the storm to come right over us (expand ACES with radar assistance). if you could draw red circles around some of the identifying features of the clouds it would make it very easy to determine what is indicated. This was an excellent introductory lesson! Great information. More people should be made aware of the conditions around them and how to react to each situation. VERY good information. The lesson before is a brief over view but this gets into specifics. The lesson was carefully conceived and thorough. Informative, but suggest they Add arrows to cloud graphics to better delineate features. Great lesson I would advise most anyone to take the course. Excellent information for the inexperienced. I would highly recommend this course especially those living in or near areas prone to hazardous weather. Very informative and helpful in my CERT Training! This is a very, very basic lesson. Pay attention though because some of the questions are still tricky. I learned a lot from this course. Keep up the good work. Found this very informative and easy to understand. Loved the course but navigation wasn’t always easy. Arrows pointing to clouds and virga would have been helpful. Overall very worth it to take the class. Thanks! Overall, good lessons. I'd like to see more live video of weather phenomena, with trained personnel pointing out weather features. Very visual and great to see pictures and put them together with what is seen everyday outside! i really liked this lesson. it was interesting and informative. The information in this lesson was informative, but I felt it was lacking in the technical detail. The questions and quizzes were focused on cloud specifics, but the lesson didn't provide the detail necessary to fully understand the clouds.I think a few slides detailing the anatomy of the storm cloud before showing actual pictures would help. Video of clouds and storms with commentary would have been helpful in understanding the dynamics of the clouds. I would like to see some arrows pointing to specific areas of the clouds, or circles of the parts of the clouds illustrated in the pictures. Working at a large theme park, these topics are very useful to me. They will help me keep myself, guests and team members safe. A little more streamlined and updating. Helped me gain a better understanding of hazardous weather. Some of the pictures are confusing to people with no previous weather training. Perhaps the addition of arrows pointine to the specific feature being discussed would help. Truly did grow my knowledge! This lesson was very educational and informative. This was an excellent primer. Overall very good learning experience. I am hoping there is an advanced module on this subject available. Good course and is presented well in this format. The lesson helpful and easy to understand. Great learning experience, and easy to follow. A mobile format would be wonderful for this. This is a wonderful educational tool, whether you want to become a storm Spotter or not. Living in Oklahoma, we can All use these lessons. Excellent list or knowledge and questions. This lesson was educational and helpful. This course contains well put together information and images of dangerous storms and tornadoes. You learn what to look for in the clouds to help protect yourself, your family, and your community. I very much enjoyed this and found it to be very interesting! My name is James Carrier and I just took my spotters convective basics course and i want to encourage anyone else to take the course. It is fast simple and educative. This is a well done online training course. I found the information contained in Scenario 1 to be most informative, and the pictures enhanced the subject matter well. This is another good lesson to take, I enjoyed it again. I definately would highly recommend taking this lesson as part of your spotter training. Good info on cloud types and storm types. Better description or “cartoon” of what the Cloud type is along with an real world picture. Video would also be a good addition instead of a slide show. quiz should not have multiple vague possible answers. clips would not play, had to guess at answers. A little more focus on meterology would be helpful. Focus on difference between awareness and communication is key. I would like to see more in depth information on report requirements. I would highly advise anyone wanting to be a storm spotter to take this course. Taught me a lot in an easy way! Arrows or marks to identify parts of the pictures noting specific parts of a storm or cloud would be useful. Excellent introductory course for storm spotting. Lots of info. Very useful. The photo quiz is excellent and having 154 images to reference is helpful. Great course. I enjoyed going through it, I probably missed some things so I’m going to study it again. This course is worth the effort to study. Exam is very straight forward. All topics on exam were discussed in the program. Great info and refresher. I've learned a lot from this,keep up the the good work guys'. relevant and I could look at clouds all day as I do. This lesson was particularly good at helping me identify the various components of a thunderstorm, and also in helping my understanding that photographs alone are often not sufficient to correctly identify certain features. I though I knew what I needed to know, but this class proved me wrong. I am amazed! Very well layed out and user friendly. I enjoyed taking this class. I have always wanted to be a meteorologist chaser and storm spotter! I have seen wall clouds and rotation in the past and all the time, even last weekend there was a rotating funnel here in Germantown with no warning and there were kids out playing. Also Just different storms that have popped up this year already here in Ohio and there was nothing I could do about it. Nothing happened but could have and there was no warning!!! Taking this class was the best thing for me! I can now warn others and have a faster warning put out to save lives! This is the best class I have ever took! I can't wait to warn other's about severe weather. Overall a good course. Some of the quiz questions need tweaking....three specifically are vaque concerning a given scenario and can be answered several different ways depending upon what the curriculum author was thinking at the time and failed to say completely in the question. Very useful and helpful information. Great pictures with very elaborate explanations. This is a very easy and basic course that is fun to take. This course was excellent. A great introduction to clouds, formation and different weather phenomenon. Also clearly explains the role and responsibility of a trained strom spotter. The photos and visual aids were a huge help in showing the differences in clouds and drafts. I particularly like the way I can go back and review again the information. Thank you! Use people to teach... death by power point stinks. I consider myself an amateur weather geek and this computer presentation totally blows and is uninteresting without human interaction. A wealth of information on the basics of storms. Very informative course. Increased my storm awareness. Having videos of some of the cloud formations would be helpful for comparison. Particularly when talking about rotation or the rain shafts. Seeing it in motion may be easier for some to fully understand. Great material to learn and very educational! Descriptions of cloud formations are subjective at best. Arrows indication features described would be helpful. I could not definitively locate described features. I learned a lot from this lesson . I also learned l got a lot more to learn. This is a perfect lesson for beginners like me.. It was a good learning tool. This is about as good as the third draft when the fifth draft is the final version. Lots of useful stuff; lots of spots where the lesson-developer doesn't know that they're being unclear because they've forgotten what the level of common knowledge is. The information was good and laid out well, very easy to understand. I feel some of the questions were worded in a way that did not lend itself to the correct answers. Something being said is close is in the eye of the beholder. Outstanding lesson with very important intel to help others in our communities. This lesson presents elements in "Spotting" that a storm spotter really needs to get straight in his/her head. The ACES concept is paramount in learning and using. Good training. Take the time to review or learn. It was an effective lesson for the topic I was learning. Easy to follow along, easily understood and enjoyable learning at your own pace. I wish the question below this one "What is your prior experience with the subject of this lesson?" included "Other" with the ability to enter more information and to be able to check more than one answer - I believe my 35 years as a trained weather watcher/reporter for NWS is important, as well as the meteorology courses I took at the university (which were nearly 40 years ago). I thought it was helpful to have many varying pictures of storms along with detailed captions. The online method is fantastic. I trained as a spotter 11 years ago but learned some new things here, and learned some criteria for severe weather have changed since then. I have a bad habit of reading and anticipating the question, I missed questions because they would bounce from 'select the best answer' to 'select all that apply' . Not really your fault but just a thought. Good lesson. Only wish more people would take these types of classes/training. Very good course, I learned a lot. Very informative and educational lesson. It's a good lesson, showing the different weather events. I find it difficult to see cloud rotation in clouds from still shots. If you could use more video when showing these formations it would greatly increase understanding. It was nice I think they had amazing pictures and being in a climatology class definitely helped me understand this a little more then I probably needed to. Very useful and informative lesson! This lesson was very informative, entertaining, and easy to learn and anyone with a little time and devotion can learn this. Some questions are ambiguous as they don't ask for a definite answer. Very informative and easy to follow. Although I was somewhat familiar with the topic, I found the course logically laid out and that it built upon itself to clarify and strengthen the ideas conveyed. It was easy to understand and to follow. the graphics helped convey the concepts and ideas. Great basic info that could make the difference in your life. An excellent to orient oneself to hazardous weather and how to remain safe. The experience was very educational. Wanting to become a spotter,now that I am retired. Excellent photos and descriptions of hazardous weather phenomenon. Very easy to understand. I took an earlier version of this course roughly 25 years ago. So it was partly review, but the presentationwas different. For one thing this was on-line and previous course was face-to-face instructor led. My user-name is my amateur radio call sign. good exercise, I liked the pictures and the videos it was a good way to learn the material. This lesson was good at staging a scenario and taking you step by step from a person acknowledging ACES to calling emergency services if needed and finally calling NWS to make a report of with the information that is verifiable. Again, on pictures, arrows showing exactly what the learner is supposed to see. This is good material for everyone. Excellent course. Plenty of great visual information. I highly recommend this lesson for any wishing to become more aware of how to spot potential dangerous weather, that may have impact to them or their surroundings. This course was really interesting. Do not understand last question. (Include your MedEd status) ? Very informative - only thing I would recommend to add would be captions on the videos. Great lessons for all to learn! since i couldn't make it back to sky warn class to re-certify this was a better alternative for me covered the same things in class last year. I gained some valuable information in this lesson for weather spotting. However, I was not able to clearly identify many of the elements alleged to be outlined in the photo gallery. The picture galleries and scenarios were perfect. This was a great way to learn about becoming a storm spotter and what to look for. at 60 years young i know your never to old to learn.this will be useful to me as a truck driver in different areas i may be able to save my self as well as others. I really enjoyed this course. I especially liked the photo gallery at the end that had explanations of what should have been noticed in the photos (you look at the photo, then click a button to reveal a list of features). Would prefer better identification of specific features in a storm cloud. Maybe use arrows that point out specific features when discussing them. I found it hard to identify what specific feature this course was presenting on coulds. This is a very nice lesson plan but i would like to see more illustrations after answering a question i think that would give a good guideline base for people. Living in the "Tornado Alley" I found it exetremely helpful and important to further my knowledge on this type of weather. It would be helpful for arrows to be included on the pictures to show the specific portion of the photo that is being discussed. Very easy to understand. Did a wonderful job of giving examples on each topic to guide student in actual dangerous situations. The learning points were presented AFTER the quiz questions on them. It would be much more effective if the points were made BEFORE asking the questions. Then the questions would reinforce the key points. Also, eliminate questions that ask "which of the following..." and then have a subjective set of points to choose from. These do not display application, if that is what was intended. Entertaining presentation, moves along at a good pace, great media to support the lesson. Informative. I have seen clouds before but never new what I was looking at. Now, with practice, I think I can start to apply what I have learned. It was also good to bring back lessons from "Role of the Skywarn Spotter." ACES, and 7 key reporting requirements. This lesson was a bit tougher than the first lesson but it was a good challenge. I liked having actual video footage in the lesson. I don't know if that be used more often but I liked it a little better than still photos. Good lesson with tons of storm cloud related photos. I would like to see the correct answers to the questions I got wrong. Good Lesson except some of the questions have more than one meaning...unclear or seems to me.. If you have an interest in weather, then you NEED this course !!! I personally like the way you don't have to listen to the situation videos and can read them. This provides options to people to choose the best way they learn/retain information. I also like the visual aids for the cloud structures. Over the past five years, I have taken the live classes by NWS personnel. This year, I was not able to get to a class so took it here on line. I think it is good to set down every two or three years and take the on line course as it brings things out you don't always hear at a class with two or three hundred people. I liked the presentation but it would be nice to have some identification pointers at certain aspects of cloud formation and not just text description. As good as the class setting for training without having to leave home! The examples of clouds were at times confusing. They could use more definition in the descriptions helping to identify. For example, coloraton of wall clouds, something that would definitatively identify. Good review of thunderstorm basics. I enjoyed this lesson. I am very interested in weather and weather patterns, but it has been some time since I had done any learning about weather, and this was a nice lesson to remember some of what I have forgotten over the years. It is also very intuitive for newcomers to weather relations and cloud formation. Some of the information covered seems advanced for just weather spotting. Good use of videos/scenarios in lesson plan. Lots of interesting weather photographs but still photography does not give enough information (i.e. cloud rotation) to make a definitive judgement. I'm a retired pilot (31 years) flying in the Midwest and across the Great Plains. I developed a useful understanding of thunderstorms and got to observe many of them from high altitude. When you are at flight level 390 and are only "shoulder-high" to these big boys, you treat them with great respect and give them a wide berth. I've been struck by lightning three times in flight, down in terminal areas where deviations around thunderstorms are not always permitted. If you want to join ARES, or just want to get involved with storm spotting in general, this should be a must pass class for you. Great information, but more photos of storm clouds, along with maybe arrows and labels for the photos will help in the identification of the specific parts of the storm clouds. Very good course. I wish the picture gallery had live video in the training. Well thought out lesson with great presentation. Great entry level knowledge of storms. I used some external resources to identify the anatomy of storm clouds. Useful information and interesting format, enjoyable course. This coarse was easy to understand and is full of great information! The video elements of lessons could be better. Great to complete this training on my own time without having to schedule the brick and mortar class. If you want to become a Skywarn Spotter this is the lesson to take! Helped to refresh past training as a weather spotter. Videos showing events in action, describing what you are seeing and how to report it. The lesson added to my knowledge and made me more aware of potential circumstances and decision making. Broken html in Scenario 3 » "welcoming sight"
Maybe add graphic elements in the pictures to more clearly point out the cloud structures. I like the use of static images, (so it wasn't like watching a tv program) with the voice overs. It's great to hear both male and female voices in the presentations. Very pleased. This was a refresher course and much more informative. Helped further my knowledge of storm spotting while remaining safe. Identify the examples from multiple choices. Glad I took the course, but it could use some improvements. For example, videos aren't used for judging our ability to recognize weather phenomena; still photos are used for that. This isn't a technological issue, as videos are used to present different scenarios and how to respond to them. Quiz questions and answers can seem inconsistent as well, almost as though different people wrote them with different scenarios in mind. I had to change devices (Kindle to pc) to finish course as screen kept going black. That same page also contained a coding error that left "p class="question">" at the start of one question. Still, glad I took the course. Will review the material, especially the photo quiz. Excellent content, easy to understand. Will recommend others to take. So very interesting and informative! Great instruction and good images for learning. overall would recommend. Great information that helps one to be aware and plan for personal, family and community safety. I studied learning theories in graduate school that did not include Ebbinghouse' spaced learning theory. It really works for old codgers like myself (79). Great Course. I would recommend adding additional material to properly differentiate the identification differences between a shelf and wall cloud. Very valuable information. This stuff could save your or someone else's life someday. I will be watching the sky more closely to identify the different parts of a storm and storm types from now on. This lesson was very informative and also eye opening to new infomation I've would have never have known until I took this course on Skywarn Spotter Convective Basics. Very interesting. Love HAM radio as a hobby and service FCC rule part 97 sec. 1 a) and b). This test made more sense but still needs more work on the options / point system. Would be nice if it explained the reason a question was answered incorrectly. I'd like more questions to gauge the measured standard of behavior. I would also like more information on cloud types and more on wall clouds. I was unaware of the length of the lesson so I had to leave to do other things then return to the material. Lots of detail in the study material. Good presentation on this topic and good questions asked to insure understanding of material. I would like to see some video of theses storms that show updrafts, wall clouds, etc. Or at least something like a pointer in the photos that point out things like the updraft. Great information on this lesson! Great course. Please look over the quiz; I think some of the answers have issues. Course was beneficial to my storm chasing hobby. Actual communications, I think, would be better instead of script. It might make it a little more understood. It's a very good lesson. This was a very good lesson - I learned a lot from it. I will recommend to other spotter to take this online class. Highly recommend anyone who wants to be a Skywarn Spotter to take these courses. Good lesson. Could point out parts in photos that are being referred too. This was easy to follow. I relay enjoyed the videos. Good information and effectively presented. The information provided was extremely informative and useful! I believe this training is something everyone should take. It establishes a solid foundation for every citizen's understanding of what they are seeing on TV from their local weather person. More importantly is the awareness that will allow them to process weather as it occurs out of doors, in real time. To have this knowledge as a baseline or foundation and then get the classroom Storm Spotter and Community Emergency response Team (C.E.R.T.) training would make anyone a better community partner as well as a more resilient community as a whole. I liked the illustrative pictures of cloud formations. And the short tutorial videos were well done. Photo Quiz was great. Looking at the photos, deciding what was going on, then seeing the answer helped me. It was a little unclear as to how to do it, as I missed the "Show Answers" in the upper left corner and only saw the controls in the lower right. Maybe make that more clear? I liked this one the best. Nice work! Would be nice to know correct answers on the quiz. The course would be a lot more effective if videos were used showing the different types of cloud formations instead of describing what they would look like. Actually seeing rotation forming, etc. would be better. This is an excellent training guide to use toward your storm spotting knowledge. Well laid out teaching tool. As a Ham Operator I will let other Ham's know of this program ! The pictures used in this class were well chosen, because they were clear. For the most part you did not have to guess at what you were looking at. There was a lot of information well done. Since this was the second lesson I had taken, I had a little easier go of navigation. I find the print based with pictures easier to work with than the video. I would suggest making it a little more user-friendly to downolad that version. Some of the interactive elements feel dated. More video would be useful. Great information that everyone should be aware of! Very informative and useful for my job. Excellent pictures to help visualize components being taught. Good course, effectively presented for understanding of t.storms. The photos of clouds are very helpful. I would like to see more people aware of weather elements. Very well written with excellent photographs and useful information. I have studied Skywarn spotter training courses both online and in person from Memphis NWS and Greenville, SC NWS. This is a refresher course for me. It was very helpful. easy to understand and follow. love these lessons. very interesting. thank you. Multiple examples of the variations in cloud types shown in the quiz give a huge boost to knowledge. Good course. Definitely helped me understand the different between shelf clouds, wall clouds, tails, funnels, tornado's etc. I like it a lot. It has a lot of good info. Wording of some of the questions could be clarified. There are also a few typos in the text of the lesson material. Great lessons, only suggestion i would give instead of just talking about the images actually have animations (arrows, markers) on the images to better point out key parts of the images. I felt like some questions were asked before the videos. This might have been intentional to force thinking but was frustrating to me. This lesson s is great overview of convective basics. A variety of actual photos shows you how different convective features may appear. The acronyms and handy references are useful take-away pieces. The lesson is well organized and can be completed in a minimal amount of time to allow for fitting it into a busy schedule. It helped my understanding on different weather patterns and looks. The module consisted of common knowledge. Added scientific information would increase educational understanding. It is very informative. Maybe next time have a practice written report so that people understand. Because a written report will also mirror of the information given to the NWS. Very informative and easy to navigate! Terminology used in several quiz answers doesn't match terminology used in lesson. There were a few things on the quiz that weren't discussed in the course itself. I took extremely detailed notes, and paid very close attention, but there were definitely some things that hadn't been mentioned in the course that were on the quiz. Having been appointed to the Emergency Management position for a small town (300 or less) this class is extremely beneficial as its online, pertinent and gives great information. A great course that I was able to take alot from! This was fantastic and informative. Very good information in this lesson. I really liked the lesson. I learned how to know what research is necessary to know. I really liked this it helps you learn and be safe. Very good Lesson. A must for Skywarn spotters.Great source of Cloud data and types. The pictures to describe the various cloud or storm features were very helpful. Very good comprehensive study guide for SKYWARN Spotter training. Love learning about this stuff. You never know when training might come in handy. Questions were structured much better in this one. Less ambiguity, example - number of choices. The scenario driven learning is a good format for bringing situational circumstances to training. I liked the lesson a lot. That is all I can really say. Living in Western New York the weather can change day to day and on some days minute to minute! This is a great way to familiarize yourself with weather and what to look for and report! I had alota of fun learning on module and taking quizzes. It was imformative about storm spotting. I liked it but the videos were kinda corny lol. This was a great quiz. I learned a lot in the lesson. Very good lesson that I've already started using with the severe weather we have been having in our area. Cloud Identification is always a challenge in storm environments. This Course presents copious amounts of photos to gain familiarity with these cloud types. Safety concerns (ACES) are well covered. This quick was really cool. Enjoyed this lesson has lots of great pictures! Only issue is that I wish the ending quiz had more explanation and was easier to understand what answers I answered incorrectly and what was the correct responses. Otherwise, great and easy to understand lesson. Outstanding program...only caveat is confusion using the program with iPad device. Great lesson for anyone, particularly anyone interested in the weather. I would try to include video of some of these storm patterns. Seeing how they form/move would be awesome. don't be afraid , its just a quiz and there's learning to do , this helps a lot . Lovely course for identifying tornadoes. I walked away feeling safer. I would like to be able to see what I got wrong. nice format and well done with the exception of the videos. The videos should be animated to give a better understanding of the movements of updrafts and such. This lessons teaches a great deal of structure about thunderstorms, funnel clouds, wall clouds and tornadoes and also how to use ACES as well as where you should be in a severe thunderstorm. I have been a Skywarn Spotter for 5 years and this lesson has taught me a lot to be able to report correctly and stay safe. Former pilot and was involved with Civil Defense while in school in Midwest. So much info to better understand weather events! More visual aides. Arrows pointing to specific parts of storms in photos.Difference between shelf and wall clouds, etc. This was much better than the first lesson! it helped me learn about weather. I throughly enjoyed this course also and am looking forward to getting my skywarn updated. Extremely informative regarding observations of forming and decaying storms. Good review of the basics. Good thing to take to be a spotter. Have volunteered as a storm spotter for over 10 years. Retired educator. This lesson has taught me a good bit about spotting certain patterns in approaching storms. Sometimes the images and descriptions were difficult to follow; it would be useful to have particular regions of the image highlighted to show exactly WHAT led to the conclusions of the description. Other than that, everything was clear and easy to follow. I was not always able to figure out what to look at in the pictures. For instance the I could not understand what "updraft" looked like. The wording and pictures help a lot. very good quiz!!! thumbs up! Can wait to spot some weather! VERY informative! Cleared up any confusions I had about this and would REALLY help people without other education. The photo quiz was especially useful in honing one's ability to recognize various aspects of thunderstorm anatomy. Great information to help with SKYWARN Spotter roles across a variety of situations. I learned a lot during this session. good coverage of what non-wall clouds look like, and which ones may need closer attention. Great course to get you up to speed and understand concepts. This lesson is a great help for any spotter. It is well put together and straight to the points. Another great lesson for those interested in spotting. I learned a lot from this course. I found this lesson to be very informative and helpful in my understand of the weather phenomenons we encounter on a daily basis this time of year. In the Quiz section the question " What is the difference between a funnel cloud and tornado?" is extremely confusing. I got an X four different times. This means that I retook the quiz four times and each time I choose an answer for this question it still came out wrong. The correct answer is clearly not among the available possible answers. This needs to be fixed. The same goes for the very last question. very informative, easy to follow. The lesson provides extensive photo examples of weather along with descriptions. These are quite helpful. However, I would appreciate a clear textual description with comparison and contrast of wall clouds versus shelf clouds prior to looking at the photos. Great oporunity to become a spotter. Very helpful in understanding the different variations of weather patterns. The SKYWARN spotter lessons should be taken by anyone interested in public safety or meteorology. Any person working in public-service would greatly benefit from this!!! This is a great lesson! The format used in the SKYWARN Spotter program is outdated by 25 years. The amateurish dialogue and sound effects with single image slides is cheap, cheesey, and not at all appealing. This is 3rd grade level at best. The intentionally obtuse wording of questions is incredibly annoying and unprofessional. The goal is to educate, not see how vaguely a question can be worded. I am a writer with a PhD in psychology, so it is not a lack of education on my part. This is obtuse and absurd and childish and unprofessional. This is just like the old "junior deputy" program the police used to do in elementary schools 40 years ago. A real Barney Fife operation. Questions on quiz were better presented vs. the first module. The photo examples were very well presented. Great Lesson's and very Informative. Thank You SkyWarn. Great training. I liked the use of mixed media in presentation and quizzes. It definitely went into a lot of detail. Would be nice to throw some videos in or adding arrows or labels to the pictures to point out some harder to see areas (like updrafts). This expanded on what I learned recently at the Storm Spotting Training we took. I would definitely recommend this to other students who are interested in learning more about SKYWARN Spotter Convective Basics. The photo quiz was extremely helpful. This portion of Skywarn was different however I learned alot more from it. This really increased my knowledge of cloud and Tornado patterns. It helped me understand what to look for and the differences between Funnel clouds, Tornados and Dust devils. This was a great course ! Very well produced course. Concise and easy to understand. Great lessons. I would recommend this to anyone wanting to learn the basics of storm spotting, even if they are not going to be part of the SKYWARN program. Of course, please do be a part of the SKYWARN program! I have also used elements of this lesson in exams geared toward middle school/high school students, the images are particularly useful in education. Great course; very informative. I might add some time-lapse videos of severe weather formation. A little more detailed look into weather spotting and awareness. Great information and easy to follow and understand. In-depth and informative lesson with a multitude of examples showing the difference between actual weather phenomena and look-alikes with helpful commentary describing each photograph. I appreciated the volume of examples for training purposes. (Only constructive criticism is the question about prior experience in this subject area. None of the choices were applicable as I've never had the opportunity to learn this in school, am not employed in this field, and do not teach it, yet have been active Skywarn storm spotter for years and now through ARES/RACES. I'd suggest an additional choice as that of trained volunteer. The pictures were so helpful. Loved this course! Would recommend this to anyone who wants to learn more. Very informative, not too difficult. This is the second test after the role of a skywarn spotter and this had some confusing vocab words that were hard and didnt do a very good job of explaining them but still, it had lots of scnarios with bunch of photos and life expreiences so that if you were acutually there and pick your adventure thing. Very good teaching by the practice which is why i got 93 percent on the quiz. This lesson was an excellent source of understanding the very basics of weather. It explains information in a very understandable m weatheranner. Highly recommended for anyone interested in weather. The lesson has very good pictures for learning to identify storm features. It would be nice to see a video or slides with arrows pointing to what the picture is talking about. Great information and well worth the time. Now I know what to do and when to do it at a good time. I also learned to prepare for any dangerous situations coming my way. A great learning experience, and a great investment of my time. Would recommend this to everyone. Learned more from this online approach than NWS Skywarn training sessions. This was a very easy to understand and beneficial course related to Skywarn Storm Spotting. I highly recommend this course to amateur radio operators who are interested in Skywarn and want to be involved in the program. Easy to follow and understand. Excellent course to see the basics. Cloud information was very helpful. Very informative and easy to understand, helpful for anyone living in areas with this kind of weather - regardless of occupation, et cetera. It would be helpful to me to have a study sheet with basic definitions and facts. Excellent source for understanding some weather basics. Good intro or review for storm spotting. This presentation was informative and help to clarify the differences in clouds, etc. A great training tool. I learned a lot. Great learning tool to gain more information! Visual representations were key in understanding the information listed in written form. Awesome use of photographs with explanations of various cloud formations and weather phenomena. For someone like me who's job can take me to remote locations where we are indeed exposed to potential severe weather, this training is crucial! Well done! The lesson was very helpful,good training . Safety is the most important part while storm spotting; and that's not just everyone else's safety, that is your safety as well. I think it is crucial that storm spotters understand that. This learning tool teaches safety very well. This was HARD. I'm surprised I made a 93% on it. I understand the importance of recognizing types of clouds, but I think a gallery of 155 photos all back to back without any type of individualized comments on them is excessive. After a while, your eyes just glaze over and one cloud looks like another. Also, I'd like to have seen more explanation on the difference between shelf clouds and wall clouds. To me shelf clouds look like wall clouds stacked on top of each other. The biggest thing I'd say is, I learn a lot more from listening than dry reading, so more narrative would be helpful. they have to be more specific on the questions. Some questions are vague and could have more than one answer. I would like to see it available for Linux OS some computer users are not using Microsoft os or Apple's os. I would like to see more learning on cloud types and videos explaining the differences in type of clouds and weather for spotters to be able to see instead of pictures its hard to see the differences in the pictures compared to videos. Quiz was on the easy side. Excellent lesson about violent weather phenomenon. Worth reviewing by most people in general, even if only for means of educating for better general awareness relating to weather related hazards. Also helps identify importance awareness plays in personal safety BEFORE a hazardous event takes place. This module includes information that can be helpful in the event of severe weather. The terms used in the materials will be very helpful when identifying storms going forward. The mix of reading, photos, videos, and audio presentation were very effective, enabling me to easily grasp the material. Well done! I loved doing this class online this year compared to the in person classes. I felt this was more detailed and tested my knowledge which i loved and it was at my own pace. THANKS! Operating the Gallery pages was not clear to me at first, as I tended to click on the NEXT button rather than the arrow for the next photo/item in the gallery. Extremely well put together videos/photos in spotting/identifying convective basic weather/cloud formations. Very informative. Including video of rotating wall clouds would be beneficial. I will admit that the ACES portion of the quiz was a little tricky, but it is good to know these things down perfectly so when you get in a bind, you will have the knowledge to make you and the others around you safe. Good tutorials, common sense applications and well thought training / lesson plan. Really informative. I learned how to identify different formations. I was unable to see the presentations on my Ipad. was a good lesson. just wish the pictures pointed to or circled exactly what you were looking at. that way you know you are looking at the right thing. " wall clouds. funnel clouds, rain shafts. ETC." Nice collection of storm pictures. Interesting and informative, and was sufficient information without being repetitive or boring. Very similar to in-person training, but faster since you can go at your own pace rather than classroom pace. Very informative and easy to understand!!! I thought the lessons was a great start to becoming a Skywarn Spotter, even though the quiz was easy I received a 91 first try, I'm going to seek a local certification class with an open Q&A by trained veterans. I thought the lessons were very educational and that they worry about safety first is great to hear since no one want to loose their lives due to anything including the weather. The lessons were easy to follow and i was able to do them in my time instead of them being timed class that makes it easier on me but all in all a great study and recommend it to anyone that wants to learn weather safety and be a spotter. Great Pictures and videos of cloud formations and scenarios. This was a good lesson for learning about cloud structures and such. Was very easy to navigate easy to understand very well put together. Good lesson. I recommend it to others who want to be storm spotters. I did notice a few of the questions in the quiz part were based on one action being safer than another, however it was not as clear in the lesson itself whether running or holding out in a car is safer action, and a lot depends on what you know is coming too. It would be better to train people to act based on the kind of storm or flood coming rather than just saying staying in the car vs getting out and getting into a ditch is safer during the kind of event. In a heavy flooding area for example you would not want to get into a low ditch even if the storm were coming. It just seems that they need to clarify this point a bit better. Well done, informative, and concise! This course is well defined and very informative. The topics covered was well thought out and relates to everyday situations. Every part of the course could apply to weather related instances. This lesson could very well ease fears and save lives. Just as in the other section, there isn't really useful feedback on the final quiz. In addition, some of the features (wall clouds, for example) aren't explained as clearly as I'd like. It might be helpful to open up a second tab and spend some time looking at additional photos of the various features. I strongly agree that this quiz was very helpful to my understanding of weather. thank you for the information. Learned basics to spotting certain kinds of storms . I think video footage would be more beneficial than still frame photos. Also, if photos are used, then using some type of highlight or arrows to point out the specific areas of the clouds being described would be greatly beneficial. Good information with nice photos. Definitely worth your time. Good basic introduction to severe storms and their characteristics. Good lesson, but needs updated. Great educational tool to utilize. I have shared a experiance in High School. Add animation showing what you are talking about, such as lines and labels on the cloud type photos. Be careful not to hit NEXT until you have gone through everything in the window or you could miss information. Great lesson, I learned a lot. This is very interactive and is definitely not the typical classroom study or even online. I highly recommend this because it keeps you engaged throughout the entire process. I really learned a lot from this. Photos and descriptions were very helpful. Flow was appropriate. Great examples, the short time of looking at photo galleries is not going to make you a pro. I think it will take time which gains with experience. A good follow-up course to the Role of the Spotter course. This helped me to make rational decisions in reporting weather to my local NWS office. Thanks. Great module for understanding convective weather. very good training. perfect for weather enthusiasts and keeping people safe. It was difficult to determine what specific feature in some of the examples of cloud formation types was the defining one. Easy Test For anyone Who Wants To Get Into Skywarn! I really learned alot in this lesson. What I have learned gives me more confidence in my spotting ability. Great lesson! The photo quiz was especially helpful in learning convective basics. The lesson was very educational and improved my knowledge of storms and proper storm identification, response procedure, and safety. I would have very much liked the quiz to show me the correct answers to the questions that I answered incorrectly, and if it did, it was not obvious and therefore ineffective in that sense. Great overview of the different types of storms with potential to cause damage. Great course for beginners. I always recommend it when I am assisting firefighting classes study severe weather. Very interesting and usefull informations! This is amazing, I definitely would use this in learning the basics of Storm Spotting. This lesson is great for teaching spotters the characteristics of clouds to be aware of. Users should take the Role of The Skywarn Spotter lesson before attempting this lesson or quiz due to its information. Invaluable information for those wanting to join Skywarn. Awesome online class, wonderfully written, and concise! The module was a decent one. The voice is somewhat emotionless but the scenarios were well throughout. Might suggest adding a scenario with a male Skywarn Spotter. Equality is key in America. Was informative, I would do more with the study of cloud formations. The videos took a long time to load. Excellent course. Would like to see more in-depth presentation and more graphics. Although, English is my second language the format and content were relevant to my understanding. Very well presented and easy to follow. I enjoyed the on-line training modules and learned alot. I like that I can review sections again if needed. This lesson helped with my identification of several elements of weather and the hazards presented by those elements. The cause and meaning of the elements, as well of the indications of what they mean were instrumental. The videos could be more captivating. I enjoyed the material but the review questions asked about material or terms that was not presented. Good information, easy to navigate. Enjoyable. A better description of the difference between a wall cloud and a shelf cloud would be nice. I would be nice to see the images used have identifying marks indicating very specifically the areas under discussion. Overall a good training but has room for improvement for use by those with far less knowledge coming in to this. Great course, its short and didnt take a lot of time but the main thing is that it held my interest. there is nothing that i can say to make it any better. Great course. Learned a lot! Great class! Learn a bunch! Very informative and helpful in making reports and identifing storms types. Lesson was very informative. But I would have liked more in depth material on the clouds and wall cloud stuff? Very easy to follow the lesson. Well written. This was a grand experiance. This taught me things that i never knew before. Great training! Would recommend it to anyone. Great course for gaining a basic understanding of severe weather and preparing for severe weather reporting if it ever becomes necessary. Every ham operator should be required to take this course. After being 20 miles from an F4 tornado, you bet your bottom dollar, I'm taking this class!!! i was unprepared, panicy and had no clue what to do. At least now I'm a bit more prepared. I'm going to move on to be more prepared. F4s are terrifying!! It was a good module however some of the questions and answers contained in the module itself were ambiguous and a bit too open ended for multiple choice or true/false in my opinion... The visual aspect was very good. I do agree that side by side comparison of shelf vs wall clouds (and maybe include scud and cold air funnels) would have been useful. Great course ! I Loved it . Very informative course! I like the mixture of video, photos, reading, and mini-quizzes as the course progressed--I think it's easier to retain information when examples are shown and various methods of presenting information are used. More enjoyable too! Better even than the Role of the Spotter course. I'd like to see video examples of the shelf clouds mixed with an actual wall cloud(s) since you can't really tell from the stills. Really like the mixed media instruction and the questions with close possible answers that make you think. I enjoyed this module and the previous one very much. The interactivity was very fun and the views were very easy to see. I really enjoyed this course; it was more in-depth and informative than the weather portion of my pilot ground school training. I would recommend it to anyone who likes learning about the weather. Learning about weather patterns is very interesting, educational, and informative for daily living and helping others. Also, a great conversation with people. People always talk about the weather. Great course, makes you very aware of what is going on around you. Very Informational! The photo presentation was excellent! Great course, well put together. Help you understand severe weather and safety for severe weather. This was very informative and helped me understand severe weather better. As a Spotter Network trained spotter, I found this helpful. The only thing I would add, are links to online further Sky Warn training to finish the training. Such as live on line training sessions etc. Very helpful in identifying clouds and cloud formation as well as reporting criteria. Taken seriously, I found this to be informational and fun. The videos were helpful and the quizzes allow you to see if you learned from it and how you did. I learned more than I expected and what I learned I can now apply to life and possibly help others. Thank you! This course is very well done. It provides an excellent knowledge base with regard to convective weather and severe storm safety basics. The photographs and explanations of different storm cloud features are an excellent tool for learning about the severe weather associated with these types of clouds. The photo gallery is also a valuable tool for additional learning and practice. Just finished the class. Very informative. Well paced, pleasant voice - well done. This was exactly what I was hoping to find in a Spotter's educational module. The material delivered and concepts explained were flawlessly easy to follow along and understand. I'll recommend this to all my friends and family even if they don't wish to be spotters. I feel that everyone should know or be informed of how to read or report dangerous weather. Most important, how to protect themselves. This is great module. If you like weather and what to know: 1) what is weather spotting? 2) who can be a weather spotter? 3) what do I need to know to be a weather spotter? 4) what is ACES? how does it help me stay safe? 5) what is convection? 6) what are storm and cloud features I might see when spotting? 7) how do I make reports to the NWS? then this is the module for you! You will learn all this and more in this interesting two part class that can be taken right on your computer, where ever you are! After you take this class, you can help share knowledge of what you are seeing on the ground to your local NWS office! Who knows? You might even help saves lives and property! Excellent Module for those thinking of becoming a certified spotter. This module gives you the basics of what you will need to know. Highly recommended! LOVED the course. Highly recommend to gain knowledge to keeping yourself and other safe. Loved it!! Really great training mod. The only thing that I can give constructive criticism on is that the review questions were worded differently and because of that I got some questions wrong. But it wasn't that big of deal because they were only the review questions and not the quiz questions. At least the quiz and the review questions were worded the same! Nice class to take you can always use this training no matter where you live it can save lives. For a life long severe weather enthusiast, and a ham operator, this class helped me understand what storm features and observations constitute a good spotter report. Now I can serve Michigan and help save lives during severe weather events/ Thanks MetED! Very informative! Great media and easy to understand! Excellent course that is very informativeand,great work with the picture senerios. Excellent module. Good use of scenario and written content with pictures. Excellent program with a variety of teaching styles to fit anyone's learning ability. This is a very useful course and employs a lot of great photographic examples to illustrate the real and look-alike phenomena Skywarn volunteers may encounter in their duties. At the end, I would highly recommend going through the Photographic quiz, think about what you see in each photo, then click for the answers to see how close you got. It took some time to do this but was extremely useful in hammering home the characteristics of clouds/storms. Very informative and user friendly. Easy to use with great information and on your own time and location. I think the Modules are really great and I would like to commend MetEd. I am an amateur weatherman and the training provided will definitely assist me in doing a better job. Thank you MetEd. Great info. Always have had a passion for weather and found this to be very educational. I am a retired Army Aviator and this was a very good basic course on weather and meteorology! This is an Excellent course for you to take to help keep you and your family safe during a Severe Weather Event. May help someone else too!!!! Recommend this to EVERYONE!!!! Tip top of a weather spotter training program. Learned much. Challegned with valuable information. Will notify many people about this course, and get them interested. Excelente módulo! Especialmente la última sección de identificación de fenómenos mediante fotos. An Excellent Module. Very fun and informative. Gives you lots of pictures of many different stages of storm development. Excellent interactive media ties in well with the topic. Good, easy to follow and informative. I like how all parts are tied together in this module. Great! DO NOT bypass the PHOTO QUIZ! This is where you put it all together with the terminology and actually seeing it! great learning tool for anybody who is interested in what is going on above our heads!...So many little tidbits in here that could save a life! well worth the time! The module is extremely easy to follow as it includes descriptions and the people in the videos are not talking so fast that you can't hear. It's nice, both of the modules are. The module provided a condensed overview necessary to identify convective storms and their major components. The photo galleries were a great addition and helped to connect theory with reality as well as cement the information learned. I would encourage anyone who completes this module to also read through the Weather Spotter's Field Guide provided by the NWS, as it builds on the information covered in this module and explains the life cycles of thunderstorms in more detail. Great course and a great way to learn storm spotting. Thanks! I did better on this module than the last one. I sure beats having to go to a class. Thanks for making this information available. Very good course...it's great you can take it on-line from home. I would highly recommend it. This module is SUPER great! Very informative, easy to read/understand, and realistic! It has amazing pictures that help you to visualize the different weather scenarios. This module is what helped me to become a Storm Spotter. I definitely recommend this to anyone out there! Very informative and interesting instruction on the safe and accurate practice of Storm Spotting. Amazing photography illustrates the various types of storm cloud formations. I recommend it to any individual who aspires to serve their community as a SKYWARN Storm Spotter. March 2017: HTML and media assets in this lesson have been updated for current browsers and mobile devices.